Many organizations have trouble sustaining Lean. Toyota is one of the few exceptions. According to Jeffrey Liker and Gary Convis in their book “The Toyota Way to Lean Leadership”, their secret is their leadership system. What can other companies learn from Toyota’s ingenious mentor-mentee system and Likers' book? Below our findings, and the comments of Jeffrey Liker about that! Trying to become Lean and going on a diet have many points in common. It is relatively easy to get Lean, or at least to have some initial success. However, it is far more difficult to stay Lean. The second law of thermodynamics states that the amount of disorder and thus the amount of waste tends to increase. The shining example of Lean, Toyota, seems to defy this law. What is different within this car manufacturer? Their leadership system, state Jeffrey Liker and Gary Convis in their book “The Toyota Way to Lean Leadership”! What most companies already learned during the last decade is that tools like value stream mapping and Kanban are only one side of Lean. In addition, a cultural change is needed. Compare it with someone who wants to lose weight. A quick-fix diet will not sustain weight loss, a lifelong change in lifestyle is necessary. When Lean processes slip backward, many managers attribute this to ‘resistance to change’. Therefore they ask themselves the following question: ‘How can I get the workers on my side?’. Unfortunately, this is the wrong question! A Lean manager should not try to convince others, but give people chances and challenges to improve themselves. A Lean leader should coach when needed to make his or her people increasingly good problem-solvers, and should make clear which improvements are needed the most. Finally, he or she should oversee that local Kaizen-activities are not conflicting, but complement each other. Because processes and people are improved simultaneously this way, new leaders are developed continuously. Every leader is not only coached but is also expected to be a coach. This mentor-mentee system extends from the top executives to the plant managers, and from the group leaders to the team leaders and finally the production workers. This last group deserves at least as much respect as all other people, since only production workers add value to the product. In Toyota there is no boundary between thinkers (managers) and doers (operators). The ideal is that everyone works for ‘one Toyota’, and continuously improves themselves and the company. Seen in that light, Kaizen and PDCA-cycles are not only for processes, but also for people. Authors: Jeffrey K. Liker and Gary. L. Convis. 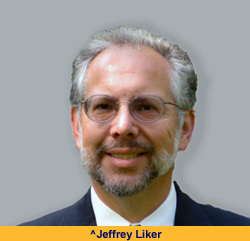 Jeffrey Liker became well-known in the Lean community, after he published his bestseller “The Toyota Way’ in 2004. Many other publications about Lean and Lean management followed. He is professor of Industrial and Operations Engineering at the University of Michigan, and also active as a speaker and consultant. Gary Convis’ career in the automotive industry is impressive, it spans more than 40 years. 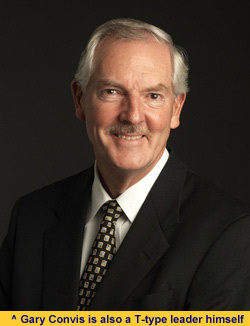 After 20 years at Ford, he became the first General Manager of NUMMI (New United Motor Manufacturing Incorporated), which was a joint venture of GM and Toyota. Later he became president of Toyota’s largest plant outside Japan, Toyota Motor Manufacturing Kentucky (TMMK). He left Toyota in 2007 to become CEO of Dana Holding Corporation. This company was successfully restructured and transformed to Lean by him, former GM CFO John Devine, and their team. Today, Convis is COO of Bloom Energy. ++ A very comprehensive description of what Lean leadership development looks like in Toyota, and how this explains why this company not only achieved operational excellence, but also survived many periods of crisis and continued to be successful for more than fifty years. +- Although well-written, this book might be too complex for people who are not familiar with continuous improvement methods. On the other hand, it contains a lot of new insights for experienced Lean practitioners. - There seems not much room in this book to be critical of Toyota’s leadership system, although the authors do discuss some recent problems within Toyota. For example the recalls a few years ago and the supply chain disruption after the earthquake in Japan. If you want to become a Toyota-type leader, of course you need some talent. Charisma is not important, understanding what happens on a shop floor is, and you need to be eager to learn and reflect continuously. Within Toyota you are not a born leader, but you become one by practicing for years and years, like someone who is learning to play the violin! Creating vision and aligning goals. All 4 aspects remain important during an entire management career. However, in the beginning the focus is more on self-development (1), later this shifts to developing others (2 and 3) and finally to aligning the improvement goals (4). This way what is called a T-type leader is developed. Such a leader grows like a tree. It starts with the roots: you learn to improve processes in one particular technical area, and help others to do this as well. When you have gained deep-rooted expertise in your “home area”, it is time to broaden your leadership skills by branching out to other departments and sometimes even the entire enterprise. Note that this makes it unthinkable that a CEO of Toyota has no practical experience with the process of making cars! In the beginning of the book I was confused by the term ‘self-development’. Later I discovered that this does not mean that you are left to you own devices. On the contrary, you are coached during your entire career by a sequence of more experienced leaders, so-called sensei, to develop Lean thinking and doing. A sensei doesn’t provide pre-cooked solutions, but only guides you to solve problems yourself in a systematic way. Put in that way, the word self-development is very well chosen! “It is certainly true that countries with a collectivist organization, which is not just Japan, will more naturally fit into a team based approach based on contributing to the collective. That does not mean it is impossible to get people in individualistic cultures on board. First, all individualistic countries, like America, have strong traditions of teamwork in many areas such as sports. Second, there is a lot of variation across individuals, so engage those who have more of a collectivist orientation. Third, as you engage people in team Kaizen, they will often discover that they like it. Most of the tools of Lean - value stream mapping, information boards that show target versus actual, kaizen events, A3 problem solving, the obeya rooms - are methods to get people engaged in team activities and cross-functional teams. Over time people develop a commitment to those teams and will find it very stimulating to be part of something bigger then themselves. Align Kaizen efforts horizontally and vertically is done by a method called Hoshin Kanri, which means compass for management. Hoshin Kanri resembles Managing by Objectives, but there are three crucial differences. Within Toyota, the leaders and even the CEO spend a lot of time at the Gemba, so they know that what they are asking is fair. Second, target values are not thrown over the fence, but are only set after a two-way conversation which is called the ‘catchball’ process. Third, metrics are not used to control people, but to help them - in the form of visual management - to measure their own progress. Parts of the mentor-mentee system of Toyota, which develops leaders and improves processes simultaneously, are also described in books like ‘Toyota Kata’ and ‘Managing to Learn’. 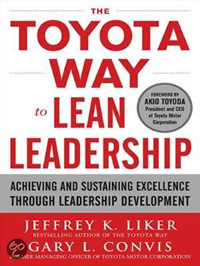 For people who read those books not everything in “The Toyota Way to Lean Leadership” is entirely new. However, Liker and Convis succeed in combining all aspects of leadership within Toyota, they add many new insights, and they formalize all their findings in a leadership development model which can be used by other companies. In addition, their book contains many real-life examples of good (and bad) behavior of leaders. Most of these stories are personal experiences of Gary Convis, who had many Lean leadership roles during his long career in- and outside of Toyota. “The Toyota Way to Lean Leadership” is definitely a good book, be it rather complex for people who are not familiar with process improvement. I definitely recommend it for advanced practitioners of the Lean approach. The leadership model is also valuable for organizations that apply other improvement methods than Lean. This is because the tools that are used to solve problems, are disconnected from the way how you coach people to apply those tools correctly. Liker and Convis stress that a company that wishes to apply Toyota’s leadership model cannot copy it. They should adapt it to their own needs. Just as it is not possible to copy technical Lean solutions, you can also not copy and paste a Lean organization! In other words: you should copy intelligently, or apply yokoten as the Japanese say. If done that way, is it possible to use Toyota's leadership model in a Western company to develop Lean leaders? The authors say it can be done. To prove that, their book contains a chapter about the Lean turnaround of automotive supplier Dana. This story resembles remarkably the turnaround of the fictitious company in the book The Lean Manager. If someone had told me that both cases where the same I wouldn’t have been surprised! Both stories are about managers who want to make their organizations Lean, with a Lean sensei, a T-type leader with a lot of practical experience, as coach. Also, in the beginning aggressive cost reduction, restructuring and lay-offs are needed (which are all not Toyota-like). Western companies in general do not have senior leaders with practical problem-solving experience. So, what is the message of Liker and Convis to those CEO’s? Should they be replaced by engineers who have worked for years and years in their company? In addition, what would their shareholders say when that really happened, since these people often only want quick results? All CEO’s of Toyota spend their entire career in this company. Although this car manufacturer is publicly listed, it resembles a family business in many ways. In my opinion, this makes Toyota-type of leadership more easily attainable in a family business. First, for the leadership system to function, your workers need to be very willing to learn and contribute to improvements. However, there are also hard-working people who just want to follow orders. I wonder how Toyota deals with them. It is a pity that this is not described in the book. Second, in contrast to Westerners, Japanese people seem to have a natural tendency to let the group's interest prevail above their own good. This is a prerequisite for the proper functioning of improvement teams. When I visited Japan I saw people preparing to take the subway, by lining-up in blocks where the doors would arrive. That would be unthinkable in my country, the Netherlands. How to deal with these cultural differences? That said, managers, consultants and future leaders can certainly learn a lot from this book!